First up tonight was Ben Poole. Since releasing his latest album “Anytime you need me” in September, Ben Poole has been on tour more or less constantly. As he told the audience, he grew up in nearby Bedford so had seen lots of bands play the Stables, so it was great to be playing there. I enjoyed the album, but tonight the songs sound much better – there’s a bit more power that comes with the live sound and that really works well. Tonight’s set was mainly songs from the new album but we also got a great cover version of “Have you ever loved a woman” – a song recorded by artists including Freddie King and Derek and the Dominos. Ben explained that they’ve been doing covers to make the sets more varied on their long tour. He’s got a great band with him which includes King King drummer Wayne Proctor. It’s a great set – a very good start to the night. Next up was Stevie Nimmo. His last UK tour didn’t go quite to plan after he fell off his bike and broke his arm, meaning he couldn’t play, so he stuck to vocals while his brother Alan who was on a break from King King duties stepped in to cover the guitar work. As Stevie joked “he’s not really up to the job but he’s my brother and he offered so I couldn’t really say no”. As he told the audience, his arm isn’t fully recovered yet (he’s still waiting for a final operation on it) but he was recovered enough to play guitar again. 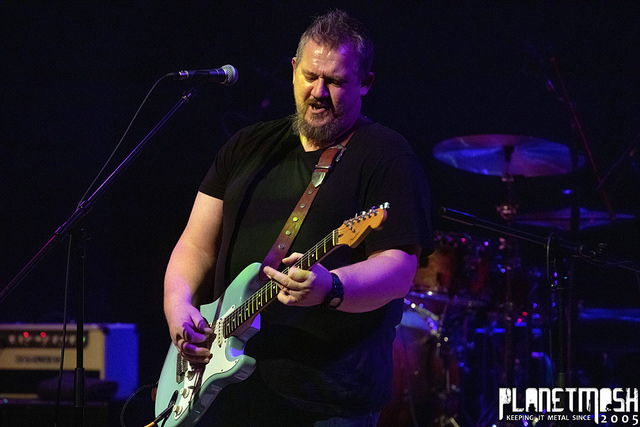 After Ben Poole’s set, Stevie Nimmo’s was louder and more blues-rock than smooth blues, and that step up in power and energy really went down well with the audience. There’s plenty of banter with the audience between songs which gave a really friendly feel to things. As an encore, Stevie Nimmo and his band came back on accompanied by Ben Poole and his band. Unusually there were two drummers playing simultaneously, which in itself was impressive to watch. It’s a great performance with the two bands working together perfectly and all looking to be having a great time. A great end to the night.